We Provide & Install Doors Built To Last! A professional installation pays attention to every detail that goes into your garage door and wastes no time getting you up and running with your new set-up. After your old garage door is removed, our technicians will carefully assemble your new panels, and then line them up with the new tracks. Next, we attach the springs and bolt everything together. Once the tracks are bolted down, we can see how far we need to pull the springs, as well as adding the torsion rod and pulleys. Finally, we connect the cables, tighten everything up, and turn on the power. We'll test it with you so that you can see for yourself how smoothly your new door operates. A new door deserves the attention to detail that we provide with our garage door installation services. A quick installation shouldn't mean a botched one. Our technicians have enough experience to work efficiently while also thoroughly inspecting every piece to ensure quality work. We ensure proper alignment for doors that roll up and down easily and balanced springs that evenly distribute the weight of the door. 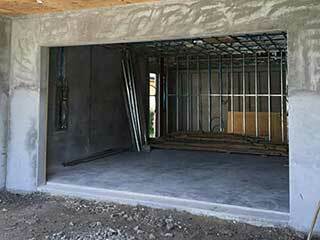 Garage door installation is a technical process that requires training and careful inspection. We take pride in our workmanship and our loyal customers know that they can count on us to do a spectacular job every time. Let us take care of your new door and rest assured that you'll soon be pulling up to a beautiful new part of your home that will function smoothly for years. Garage Door Repair Loganville is quality you can trust when it comes to professional garage door installation. We want all of our customers to have a great experience with minimal frustration when they get their door installed, and we go out of our way to make sure that happens. Call us today to schedule an appointment.